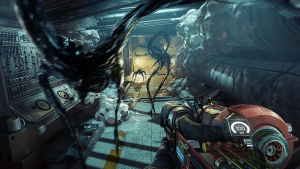 It recent trailer, called “Prey Gameplay Trailer #2” not was the basic setting of the story, but it also the release date of May 5th. The main character’s name is Morgan Yu, an amnesiac who is stuck in a space station/ research facility, filled with shape-shifting aliens. From there it’s the standard journey to stop an invasion and learning who and what you are. Currently, there is no set price for the game, but pre-orders are available, with a pre-order bonus of a shotgun. The “family heirloom Margrave shotgun” will also come with three Neuromods (which you can spend to acquire new abilities), two medkits, and a fabrication plan to create shotgun ammo (because of ammo, in general, is scarce aboard Talos I).